It’s hard to leave a political party. Florida Governor Charlie Crist bolted the GOP to run for the Senate as an independent when it looked as if former Florida House Speaker Marco Rubio, a Tea Party favorite, would clean his clock in the Republican primary. Of course, Crist couldn’t say he was doing so to save his political career. Instead, he contended that the system was to blame—and that “the people” needed leaders who would break out of partisan molds. During the April 29 announcement of his decision to run for the Senate without party affiliation, Crist declared, “I haven’t supported an idea because it’s a Republican idea or it’s a Democratic idea.” In a subsequent campaign video he exclaimed, “The parties don’t work anymore.” And his campaign even dropped the word “conservative” from its website, as the newly-independent Crist started making a play for Democratic voters. This is a trap that Crist cannot escape. Any pol who switches party or dumps one to run as an independent will leave behind a trail of inconvenient utterances. 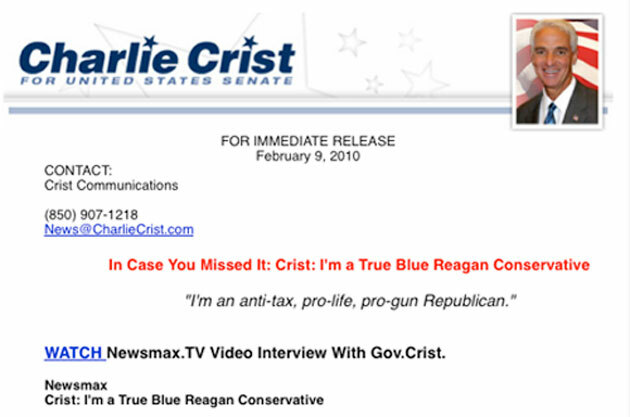 Still, next time a reporter questions Crist, he or she ought to ask, “Are you still a True Blue Reagan conservative?” And, if not, what happened to your core beliefs between since February?